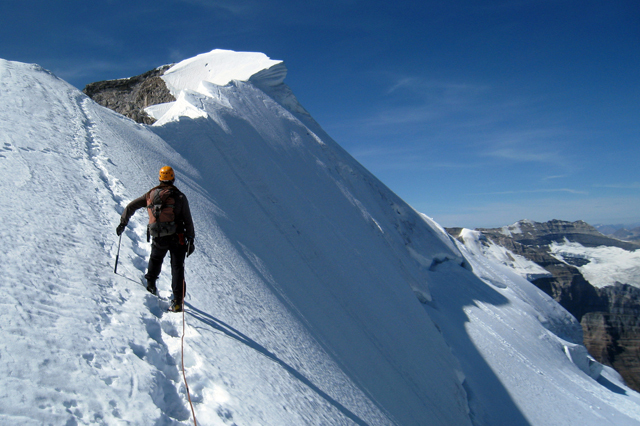 A short approach, exposed climbing and a spectacular glacier capped summit traverse make the east ridge of our Mt. Temple summit traverse a ‘must-do’. 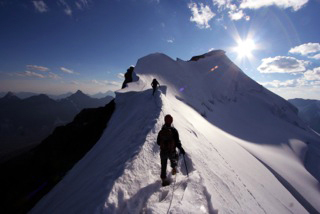 With its mix of scrambling, steep rock climbing and a long summit snow ridge, the East Ridge of Mount Temple attracts climbers from around the world. 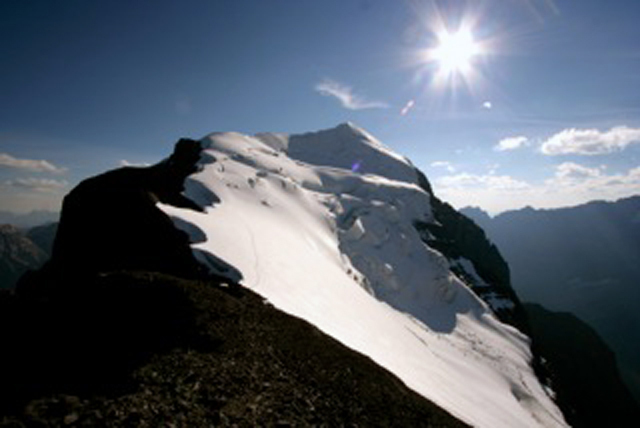 Included in the ‘Fifty Classic Climbs of North America’ by Steve Roper and Allan Steck, this route was first climbed in 1931. 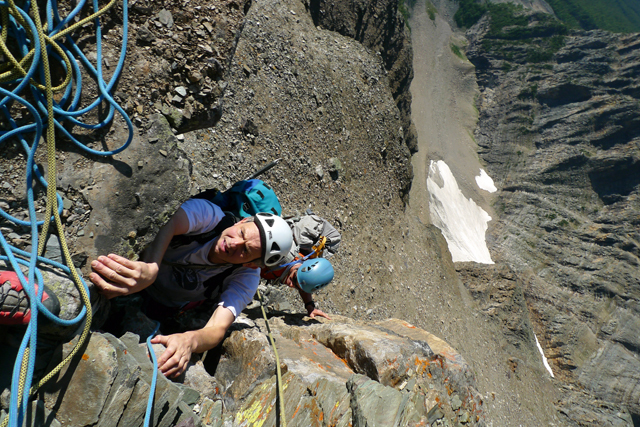 The East Ridge is a committing objective with great rewards for the experienced and physically conditioned climber. Please fill out Yamnuska’s contact form to arrange this technical alpine course if our scheduled departures do not meet your requirements. Your guide will meet you very early (likely between 3:00-4:00 am) at the Yamnuska office in Canmore unless you make other arrangements to meet in Lake Louise. We access this route along the Moraine Lake Road in Lake Louise. A short hike alongside an obvious avalanche slope brings you to the base of the ridge and the beginning of the scrambling up 4th class terrain on good quartzite rock. This leads to the Big Step, a 200 meter buttress involving a good portion of the technical climbing. It contains good protection and some fixed pitons. Following this route up thru the gulley and a chimney system takes you to the upper ridge, which we follow to the bottom of the Black Towers. Approximately 5 pitches of additional technical climbing takes us to a gully that breaks through the black band of the towers. 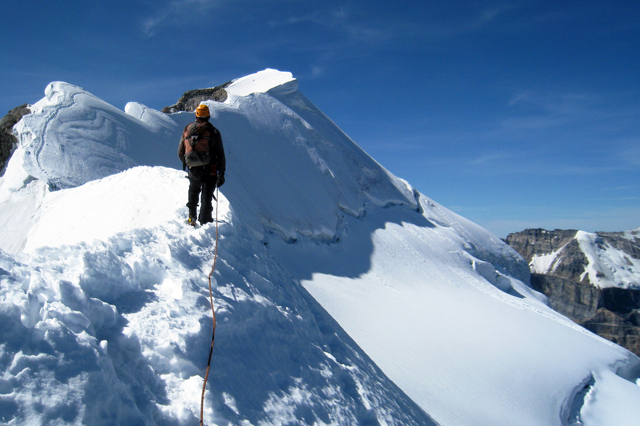 More 4th class terrain and scrambling allows us to gain the glacial ridge towards the summit. 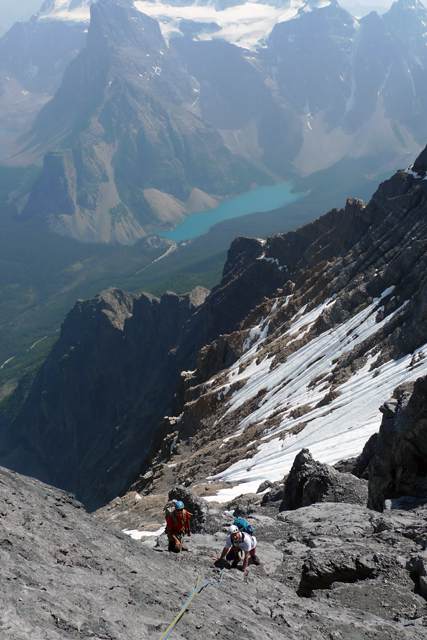 After enjoying the summit views and celebrating our ascent we’ll descend via the scramble route down the southwest ridge to Sentinel Pass and hiking through Larch Valley to the stunning Moraine Lake. Expect a 15-18 hour day. Please contact our office to organize this trip as we only schedule it on a private basis. Please note that wildlife/bear restrictions require that people travel in groups of 4 or more during much of the summer season. This will require that 2 participants group with 2 guides for this trip. Please discuss this requirement with our office. Maximum guide to guest ratio is 1:1. Our guides are enthusiastic and extremely talented. They hold certification from the Association of Canadian Mountain Guides and we are licensed to operate in the area by the Parks Canada. Maximum group size is 2, minimum 2. Accommodations and meals are not included. Please ensure that you have plenty of food and snacks as well as fluids for a long day of climbing. We supply group climbing gear such as ropes and hardware but we recommend you bring your own personal climbing gear (e.g. harness, helmet and ice axe), clothing and general equipment. We can lend you some personal items should you require. A rental charge will apply for rock shoes. Let us know, in advance, what you will need. It is required that you bring rock shoes in addition to mountaineering boots for this program. Lightweight mountaineering boots – Ideally these boots should be lightweight leather or synthetic with a semi-rigid or rigid sole. It is possible to buy boots such as the La Sportiva ‘Trango’ which are designed specifically for alpine rock. As always, the most important feature of a mountaineering boot or approach shoe is comfort. Different brands seem to suit different feet. If buying try a few different pairs and if they are not comfortable don’t buy them. There are many good brands. They include Asolo, Kayland, La Sportiva and Scarpa and 5.10. Ice Axe – regular glacier axe, minimum 55cm length. Light weight versions are appropriate for this trip. We supply the following items, but if you have your own, please feel free to bring them: nut tool, belay device with pear shaped carabiner, 1 x 5m 7mm prussik, 1 x 120 cm sewn sling and 2 x locking biners, 1 x 16-22 cm ice screw. Guests signing up for this climb must be comfortable being short roped through extended lengths of 4th class terrain and seconding 5.9 rock. 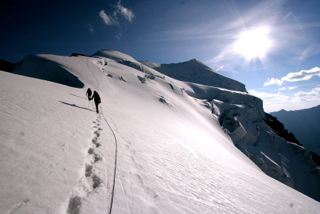 Previous experience with crampons and ice axe is also required.